Cornwall, Croydon, Suffolk and Warwickshire all seem to be planning different things for their libraries. Cornwall appears to be wanting not only to privatise its libraries but to go after contracts in other councils as well (in many different services and in collaboration with private companies), as a sort of Cornwall Ltd. Croydon also appear to be going down the privatisation route but doesn’t appear to be proud about it. Their “market sounding exercise” document is almost impossible to find on their website and, also, there is only a fortnight for private companies to register an interest. Suffolk also appear to be thinking abut the privatisation or, possibly, the divestment route. Indeed, to a casual observer, their proposals may not appear to be all that different from those ditched after large protests and the departure of their old Chief Exec. Finally, Warwickshire have produced a mammoth report for councillors that appears to present foregone conclusions (literally, with the conclusions being printed at both the front and back) about what should happen to the service. It proposes closures that the report elsewhere clearly shows the public do not want. The report also shows that only six, not sixteen as claimed in the press, groups have put in business plans for running otherwise closing branches. Andrew Carnegie called libraries the “cradle of democracy”. At the moment, they do not appear to be in the most motherly of hands. Boost for library campaign as court orders judicial review – Telegraph. Surveys current situation regarding legal action against cuts, especially in Gloucestershire and noting celebrity support. Campaign for the Book newsletter – Action has moved on from public protest to legal action. 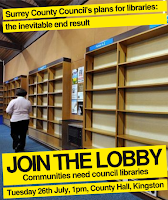 Many councils have shied away from closures but still need watching as cutting services or “divesting” libraries. Should we shrink wrap our school libraries? – plpnetwork. Article on the future of school libraries with substantial reference to the future of public libraries. #uklibchat LIS Student campaigning – Google Docs. Summary of #uklibchat meeting on twitter between Library school students. Some interesting points. Middlesbrough – Some libraries may close. 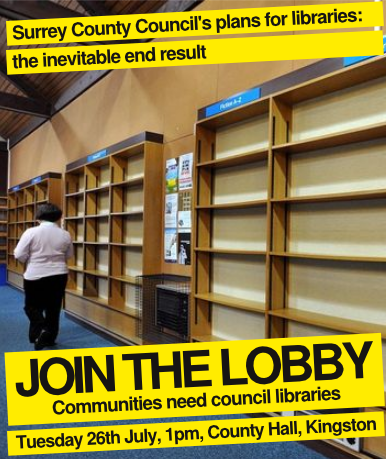 Croydon – Future of Croydon libraries – Croydon Council. See also Library services market sounding exercise – Croydon Council – [This page is very difficult to find on Council website]. “Businesses and organisations that may be interested in participating in a possible future procurement exercise are invited to complete and return a questionnaire which would then form the basis of informal discussions with both Councils. That process will include seeking the market’s views on the further development of library services to the benefit of the public, and any alternative delivery models.”. “Market sounding” is from 4th July to 19th July. Gloucestershire – Residents “ready, willing and able” to run library – This is Glos. “public-spirited Prestbury residents poised to step into the breach to keep their library open will have to wait for the results of a judicial review to find out whether their services will be needed.”. Article appears to argue that the judicial review into libraries is unpopular amongst library users. Hertfordshire – Save New Barnfield Library – Liberal Democrats Campaigns. Central Resources Library to be closed, reference collection going to Campus West Library “if there’s room”, Lending stock going to non-public access warehouses. Petition to save library. Warwickshire – Libraries in Warwickshire – Warwick West Labour Team News. Ex Warks Libraries HR employee and now Labour councillor expresses sympathy for library staff and worries over long-term future of “divested” libraries. Queries whether cost of redundancy/pensions would actually mean any savings for the council. Warwickshire – WCC Library Report 02: 11 Recommendations: Welcome to Google – What’s in Kenilworth. Continuing dissection of report notices the followin (a) the recommendations (to close libraries) are at the front as well as the back (“I am trying to think of a reasonable example where you are told to make a decision, before you hear the evidence”), (b) 14 libraries to have reduced opening hours, supplemented if possible by the use of volunteers, (c) volunteers given until August 19th to prepare business cases, with final decision to be made in October, (d) mobiles to be cut too, (e) yet more cuts next year, (f) bookfund maintained with no cuts, (g) up to 120 staff (50 FTE) to be cut . Warwickshire – WCC Library Report 03: The next 11,000 words: Somewhere to hang my hat – What’s in Kenilworth. (h) Author argues all points be contested e.g. report argues that cuts will only affect 10% of visits but “would you take away a disabled access ramp in a village, just because only two people use it?”, (i) calls twitter users a “hard to reach” audience (! ), (j) 10,000 signatures on petitions asking for libraries to stay open, (k) very importantly, only six groups have provided business cases for running libraries cf the 16 previously claimed by the council. Print article This entry was posted by Ian Anstice on July 9, 2011 at 10:32 pm, and is filed under Uncategorized. Follow any responses to this post through RSS 2.0. You can skip to the end and leave a response. Pinging is currently not allowed.